Your health education specialist certification (or CHES) is nationally recognized as a measure of your ability to meet and excel the guidelines and standards of the health care industry. This gives you a great advantage in the job market, as employers are seeking ways to distinguish candidates who are qualified and experienced. Here are a few ways to market your certification in a job interview. Highlighting your value to the company shows that you not only recognize your worth as a professional but that you are also able to bring something to the table that other candidates may not. Keep in mind that a job is able to provide you with many benefits, but employees, especially those with additional training and certifications, can also provide their employers with benefits. This is a great bargaining tool in any job interview. When applying for a particular position, determine what extra value your certification could bring to that organization and be prepared to discuss it. For example, a future employer will be able to market themselves as a provider employing certified professionals, or they may wish to include the logo of NCHEC on their website to increase their value and trustworthiness among patients and consumers. How many hours of continuing education did you elect to pursue in order to receive a certification? How many different techniques and skills did you receive hands-on experience in? What types of industry issues or topics did your courses cover? Mention the independent critical thinking skills proven by the CHES certification and your ability to problem solve as a result. Employers are looking for qualified candidates who are able to be self-starters that can solve the many inevitable problems that will arise in the healthcare industry on their own. A candidate who can provide proof of problem solving skills can stand out as a qualified candidate who can offer solutions to problems rather than hitting roadblocks when they occur. The fact that you chose to pursue a certification that you did not have to have shows your willingness to work hard and pursue opportunities. 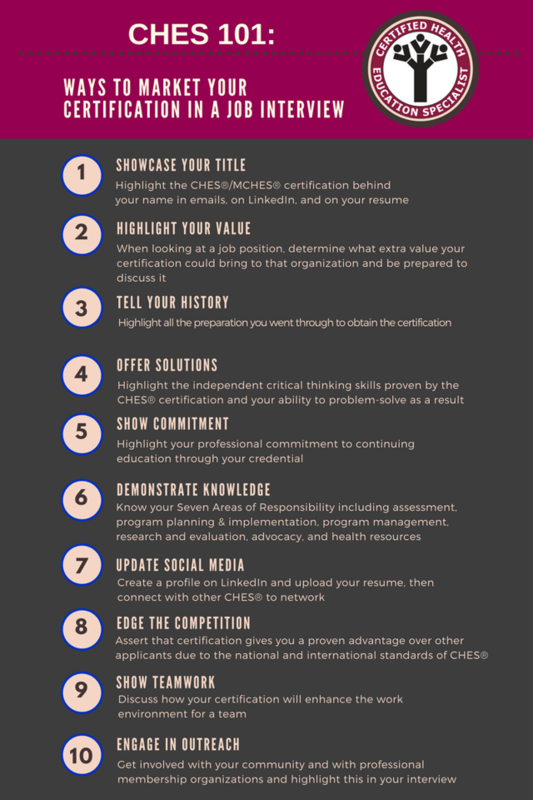 Highlight your professional commitment to continuing education through your credential by explaining why you chose to pursue your CHES certification and detailing the process. If you're a recent grad, be sure to mention that your certification provides you with a wealth of hands-on experienced not possessed by graduates who did not pursue a certification program. Create a profile on LinkedIn if you don't already have one, upload your resume and qualifications, connect with other CHES candidates to network, and apply for jobs. Many employers request your LinkedIn profile name so they can access a digital copy of your resume and experience and learn more about your connections and skills and services that others can attest to your ability to provide. According to the U.S. Department of Labor (DOL), there were an estimated 57,570 health educators in 2016 while employment of health educators is projected to grow 21 percent from 2012 to 2022, faster than the average for all occupations. Assert that certification gives you a proven advantage over other applicants due to the natural and international standards of CHES. Many employers prefer to hire candidates with certifications because they can count on their ability to problem solve, work well with others, and behave in an ethical and responsible manner. When speaking with a potential employer, discuss how your certification will enhance the work environment for a team. Download this free guide to marketing yourself in a job interview as a resource.